Other UK classical music blogs and Sir Paul McCartney are having a Diana moment over the reported closure of EMI's Abbey Road studios. Demands are being made to turn the studios into a museum and performance space, mourning fans are reportedly gathering outside the famous venue, and floral tributes on the railings must follow shortly. All of which is of course errant nonsense. I have already commented here that it is sad to see the inevitable happening. But have my fellow bloggers and Sir Paul failed to notice that things are changing in the music industry? Virtual spaces - performing, recording, and retailing - are rapidly replacing physical spaces. No point in debating whether it is good or bad, it is happening. Another music venue is the last thing London needs. On any one night many of the current classical music venues are dark, and most of the rest are hosting performances of Tchaik 5. Last week it was record shops closing, this week it is recording studios, next week it will be concert halls. The thought of turning Abbey Road into a Beatles theme park for Japanese tourists is infinitely worse than letting a wrecking ball loose on it. Look what happened to the National Centre for Popular Music. EMI's present owners failed to understand that physical music spaces are a thing of the past, and they don't seem to be the only ones. As I have already said, safeguarding for the brave new virtual world the great recordings created at Abbey Road is far more important than saving bricks and mortar. 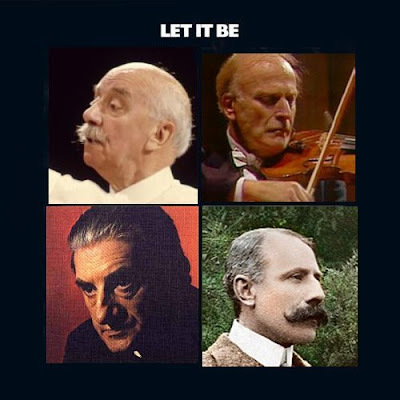 It's an odd choice to chose Let It Be to parody, as uniquely amongst Beatles albums the majority of it was recorded outside of Abbey Road. Yes, of course. But creating a montage of those four venerable classical musicians walking across a zebra crossing was just going to be too damn hard work. I have to disagree with both your ongoing sniping at the BBC and the premise that in some way Abbey Road is a dinosaur. Occasionally I play for one of the BBC orchestras as an extra player. As it happened recently we rehearsed/recorded an extraordinary piece by Czech composer Vaclav Trojan and a Martinu Symphony at Abbey Road. All the time the CONTENT of the BBC continues to include work like that I for one am honoured to be involved. I also played for one of their Electric Proms for Shirley Bassey - not AT ALL my preferred musical style but she was an amazing performer and the atmosphere that night was as good as anything I have ever been part of. Also, recording at a dedicated venue like Abbey Road is an infinitely preferable environment to cold churches and the like. Abbey Road should NOT become some kind of museum - London needs that kind of specialised space. When you walk along the corridors there seeing the soundtracks recorded alone is remarklable. Forget about the presentation and listen to the MUSIC. My licence fee is the best money I spend every year without doubt. Nick, 'Abbey Road should NOT become some kind of museum' - yes precisely, that is what I said in my article. But you say it should continue as a recording studio. However the present owners say it is not viable as such. So I am confused as to what you are saying. Who exactly should run and fund it as a recording studio? Forget about the presentation and listen to the MUSIC - sorry, been there, done that on Radio 3 and for me (don't forget a blog is a personal website) it just does not work. Imagine I am treating you to a meal in a Michelin starred restaurant. But there is one catch. To get into the restaurant you need to walk across broken glass in bare feet. No problem I tell you, just forget the pain and enjoy the FOOD. Marc Thompson wants the free market to apply to his and his colleagues very considerable salaries, but not to his programmes. Why should I pay a license fee when CDs, downloads, web radio and live music offer more attractive alternatives? I agree BBC Radio 3 does some very good things, and they do get mentioned here. But the current generation of self-serving and greedy senior management has allowed that good to be swamped by the mundane, the mediocre and the plain bad. Which is why, as a license payer, I will continue to voice criticism until things change. 'The news that EMI is to sell off the Abbey Road site, which will most likely mean demolition for the famous studios, has been greeted with predictable hysteria on both sides of the Atlantic and ambitious heritage site proposals.